A planned overnight north of Moab followed by a half-week a Grand Junction, Colorado was to be the last of the sightseeing. After that was to begin the eastward “commute” to Illinois. Unfortunately, those two stops would be no cooler at all. A solution was needed, and fast. 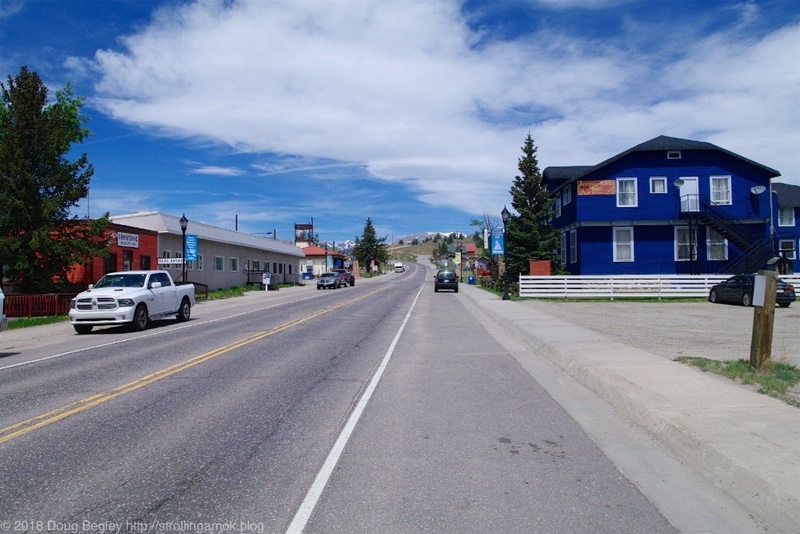 A look at the next stop after Grand Junction, an overnight in Evergreen CO, involved driving through Dillon, a high elevation area I’d had to resort to on my way out west last year, due to a prolonged heat wave then. I’d be trading away heat for cloudy skies, but desperate men do desperate things. If I could make a decent start of the day, I could drive the four hours to Grand Junction, top up freshwater along the way in Fruita (at a Colorado Welcome Center), lunch, get a shower at a truck stop, drive another 3 hours on I-70, and get certain groceries in Dillon itself. I wasn’t sure I’d be up to 7 hours of driving plus all the goofing around, especially after an unrestful night. But I was game to try, and had the option of another miserable overnight in Grand Junction if things went poorly. So, I broke camp in Valley of the Gods and refueled on the way to Moab. Maybe I could make it all the way to Dillon on one tank. While there at the gas station, I found half a dozen very presentable middle-aged couples on Harley Davidsons. They were touring the Great Southwest on vacation…and they were from France! They were delighted with the remarkable terrain, and frankly I was too. The drive up and even the long jaunt on I-70 was a serious winner. I suppose that it’s predictable that Moab had a dearth of camping rigs and tourists about now. 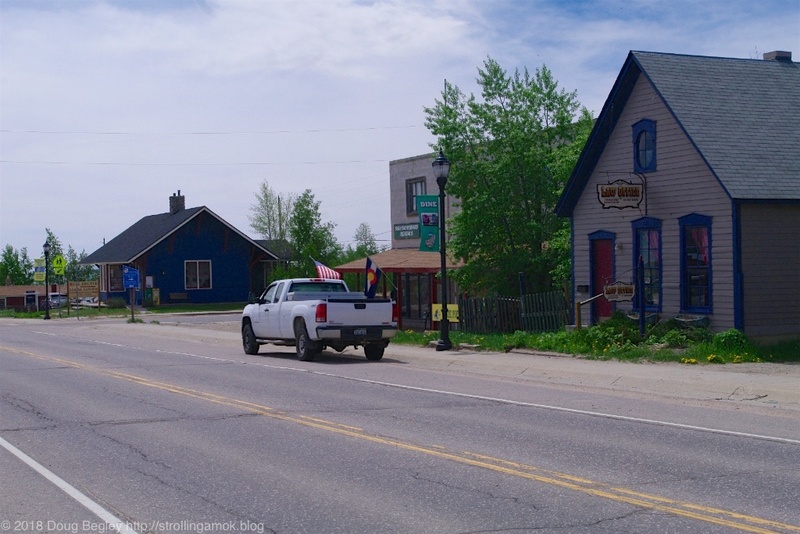 I had pictured the highway fitfully funneling through a tiny, eclectic town, but it was a rolling four lanes, and wasn’t all that remarkable. Different things strike people differently, I guess. Outside of town however, was another story. What a drive! I was on schedule when I finally pulled into Fruita, and the two dump station users in place took an inordinately long time. The guy in front of me unhooked and stowed his waste hose…and then broke out his freshwater fill hose! He sheepishly wandered back to apologize, wondering aloud why he’d reversed his routine and not combined them. That was about 20 minutes lost, but there’s no option but to, as Terry Thomas said, “press on with all possible dispatch”. A truck stop in Grand Junction absorbed half an hour more waiting to get into a shower, and I began to wonder whether I’d be picking my way up Peru Creek in the dark, and just how many campers might be diverting for cooler climes like I was. Going through Vail, fatigue now nipping at whatever it is it nips at, I saw a sign for a Safeway grocery store. Being so close to my route, I went for it. In and out, but not before I had eco-sinned. At the checkout, I was looked over to see if I had brought a cloth grocery bag and, lacking same, was offered paper bags, the stiff kind with attached handles. “You don’t have any plastic bags?” I asked. “No, just paper,” he told me. Then paper it is. For a camper in a fire-ban locale, you’re almost better off just untucking your shirt, pulling the bottom out away from you, and telling him to load it up like a sack. Recycling bins for paper are a genuine rarity when boondocking, while plastic bag returns at groceries are not. Plastic bags crush down to nothing and are handy for holding trash. Big, handled, thick-paper bags, intended to be re-used for groceries, are too large, clumsy, and always in the way. Mine re-entered the waste stream in less than a day. I got tired of moving it out of the way and trying to keep it from emerging from wherever I stuffed it in. There are drawbacks to being un-trendy in an upscale, trendy town. But I did make it to Dillon and the Peru Creek trail before sunset. Maybe, what, half-an hour or more on the trail to get to the small area suited for camping? Would there be any decent spots left unfilled by fellow escapees from the heat? The answer to that question was moot, because the entrance gate was closed and padlocked. A sign indicated that it would be opened in May, or “when trails are dry”. As I had passed by plenty of snow remnants still on the ground in Vail, and signage indicated a very low fire danger here, I guessed that, unlike the drought further west, this area was sopping wet and they didn’t want people tearing their way up the slope. No room at the inn. Signs at the entrance prohibited camping there, so I cruised up and down the length of Montezuma Road to explore purported camping all along its length. That info is apparently no longer operative, since the entire route is festooned with signs warning of no camping along county roads, no camping, no trespassing, and private property signs. I’m guessing that residents got tired of gypsy camp opportunists along this road, and decided to get rid of the problem. Cruising up and down Route 6, a feeder for a popular skiing area, proved to be an impressive climb up, up, and more up. The Mighty Furd still had gobs of power on tap, but a look at the temperature gauges showed that with the turbo engaged even at low speeds in lower gears, it would be prudent to take it easy. I was using an app on my smartphone (Ultimate Campground) that showed a couple of small camping areas to check out, but they too were blocked off from access. 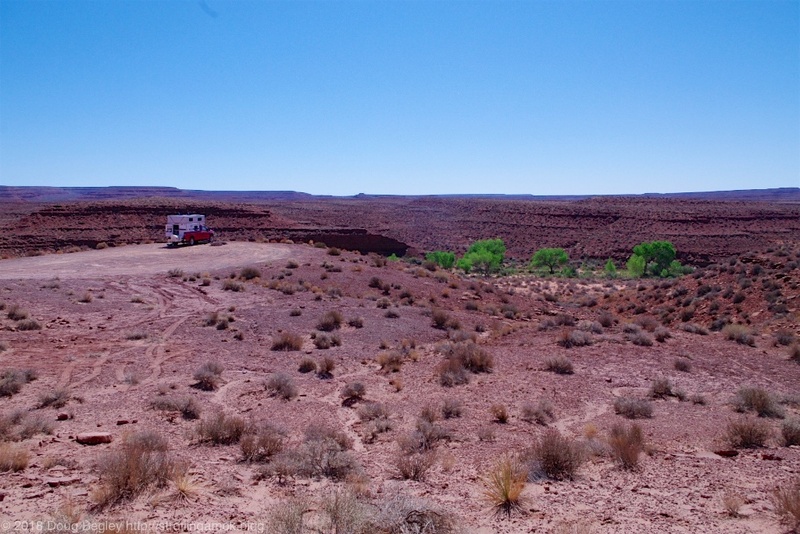 The only option was to overnight along one of two large pull-outs beside the road, which was to me a last resort considering no cellular signal to research more campgrounds. Two more potential free campgrounds on the periphery of town looked worth checking out, and as I headed back down the steep, long incline, the fuel warning alarm sounded, indicating that I had just 50 miles of reserve. Oops, I’d forgotten about fuel and my valiant quest to get here on one tank. My priorities were now rearranged. It was a considerable distance back to town, and my diesel fuel-finder app was comatose from the lack of a cellular signal. Once I got to where there was a signal, it announced that there was a technical problem and I would have to forage for fuel in some other way. Running the injectors dry in this tub means not just looking for gas and a gas container, but looking through the owners manual to rediscover how to prime the injectors so it will start up again. I’d like to avoid that, if possible. That balky app left me with the dashboard GPS which, with data from 2008, often led me to businesses that no longer existed. I then went to a string of listed stations that didn’t sell diesel, were no longer in operation, or simply weren’t there. I finally stumbled on a new station that had what I needed, and its pump gave me 30 gallons before it decided to end the affair. Could have probably taken another 4 easy, but I let the matter drop. The dash alert had estimated a remaining 28 miles to go when I pulled in. I was now in that post-sunset glow of dimming light. But I had fuel now. Two camps in the phone app proved problematic, one no longer existing and the other only accessible by a paved bike trail. Other campgrounds many miles from town could be still closed like the ones I’d already checked out. Dillon has a very large lake to its south, with Frisco at the other end. Several Forest Service camps are on the shores of this lake, and I dropped in on the closest, Peak One. $24 to dry camp. Ow. Oh well, beggars can’t be choosers. The sign said that a camp host would eventually be by to take payment, so I found a pleasant enough slot and set up camp in the very dim light of about 8:30 PM. It was a bit noisy with barking pets and playing kids, but I used my time to get online with my laptop to research the possibilities for a solid week’s stay. I began to sort through the good points and the bad, but time ran out and I’d need to continue in the morning. Once up for the day, I finally settled on an area far away to the south, but one most likely to work. 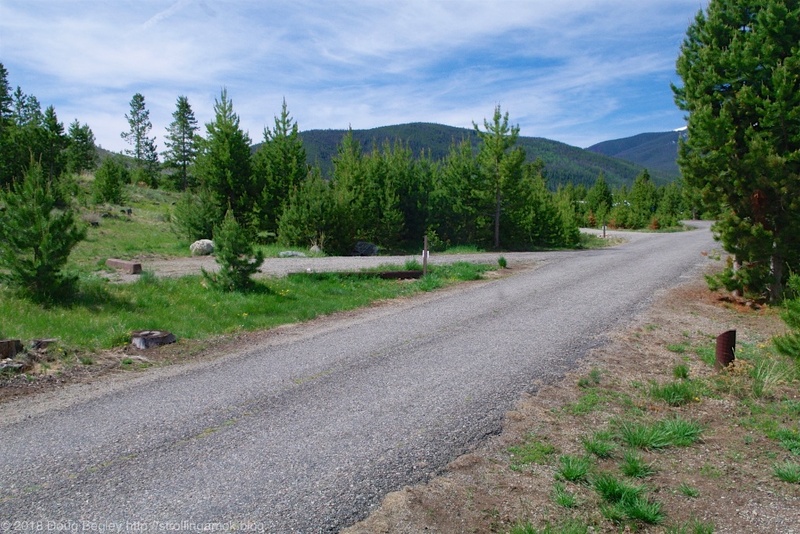 Rock Creek Hills Road is in the Pike National Forest, only a couple dozen miles away by air. A typical slot in the camp. The drawback is that the route to get there zig-zags something fierce, totaling 61 miles and an hour and a half drive time. 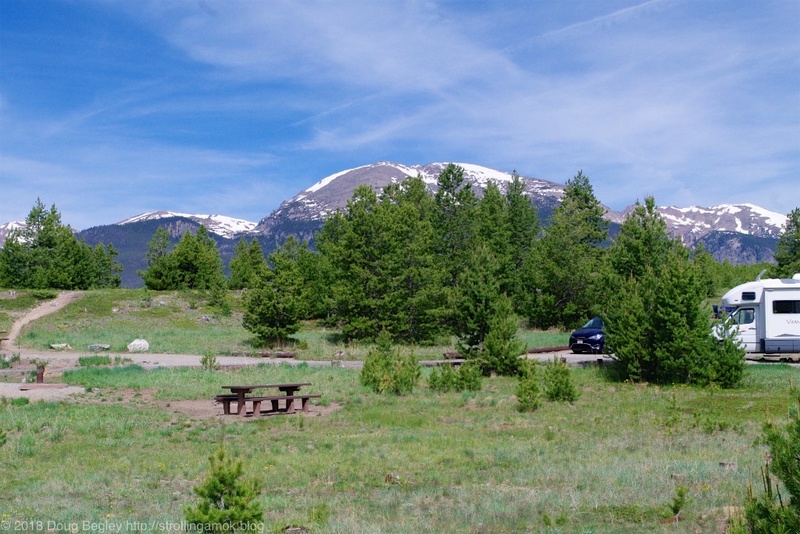 One online visitor claimed, “Beautiful, vast boondocking area east of the town of Jefferson, CO, on the way to Tarryall Reservoir. The road is just fine for larger RVs and you can go pretty far back in the forest safely. We were there during a downpour and the roads were still fine. No water in Jefferson, so stock up beforehand. Lots of campsites, insane views. On the weekends it gets busy with OHVers and hunters, so if that’s not your thing, visit on weekdays.” Google Maps made it look like there were sizable open areas for solar, and with upcoming cloudy skies, I’d need all the openness I could get. A shot across camp, to the other side of the paved loop. As I was breaking camp, the camp host walked up on her route and I gave her my cash. Being very personable, along the way of our conversation she mentioned that if I had a pass, the rate would have been discounted. When I asked what was involved in getting such a pass, she mentioned the America the Beautiful pass by one of its former incarnations. Hey, I got one of those! 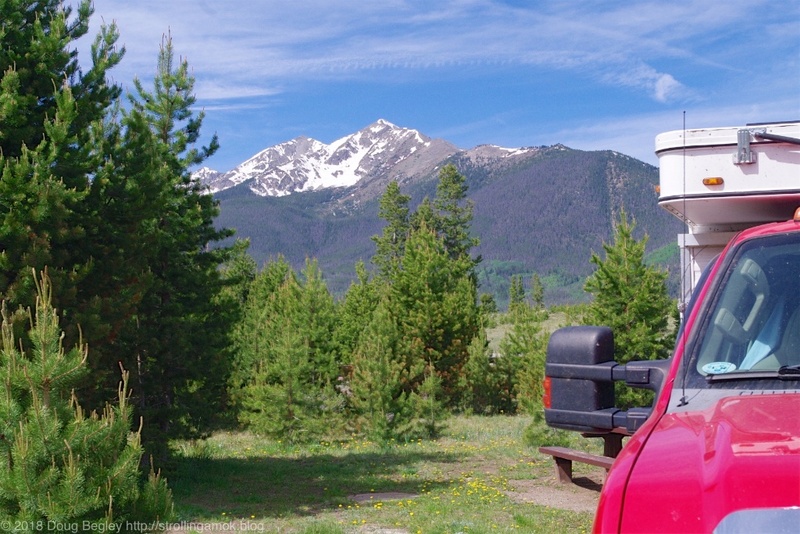 This is a Forest Service camp, not a locally-run one! I broke it out of the glovebox, she recorded the number, and she gladly handed me back $12. Great way to begin a day! And one last one, taken on the higher access road. There’s a large lake way back there, but it’s hard to discern. The majority of the route was State Route 9 to Fairplay, and that turned out to be one of several highlights on the drive. I’d had no idea that it rose and fell through mountains in a series of switchbacks. Talk about picturesque! As with Dillon’s slopes, the Furd’s Tow/Haul mode got a workout, using the engine to hold downhill speed instead of the brakes. Since I nearly always hold to the speed limit these days, I eventually collected four cars in back of me. That’s no biggie for sure, but between the Intrepid’s weight and its pronounced turbo lag at each sharp, climbing switchback, with the engine switching clumsily from too little power to too much, I began to think how much more fun this drive would be in a decent sporty car. One with light weight and no turbo to mess up power on demand. Compassion moved me to pull off to a broad shoulder at one point, to let the cars pass and have their fun. The last one in line, a convertible sports car containing a waving couple, tooted its horn in thanks and zoomed past. I’d done the right thing. Fairplay Colorado, which is much like Alma further north. The Fairplay-Veliton Hotel on the right dates back to 1873. The small towns along Route 9 have an aura all their own. One look lets you know that they have a history dating way back, and that winters here are hard. 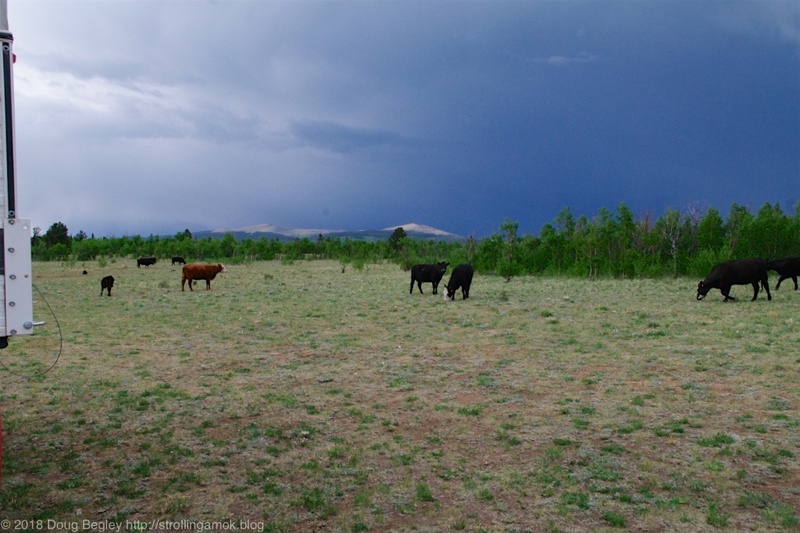 The surrounding ranches have the same look. There are few pseudo-McMansions here. 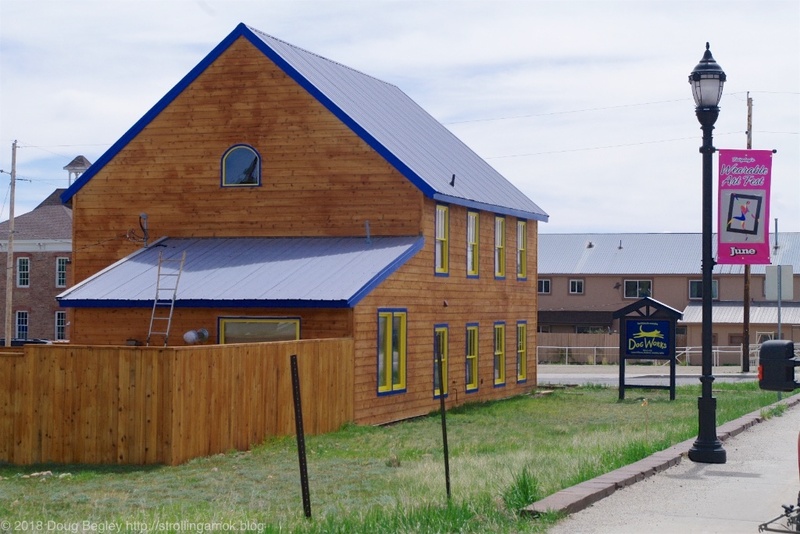 Repurposed log cabins serve as business offices, and many of the buildings are small and well-maintained, with bright colors to make them stand proudly. Nothing is any bigger than it needs to be to work. Local vehicles aren’t fancy, and it’s apparent that materialism doesn’t count for much here. There’s just something to these hardy little towns that I find appealing. Once through the micro-town of Jefferson, the road saunters through nearly flat cattle grassland that has a stream or streams wandering through it from end to end. 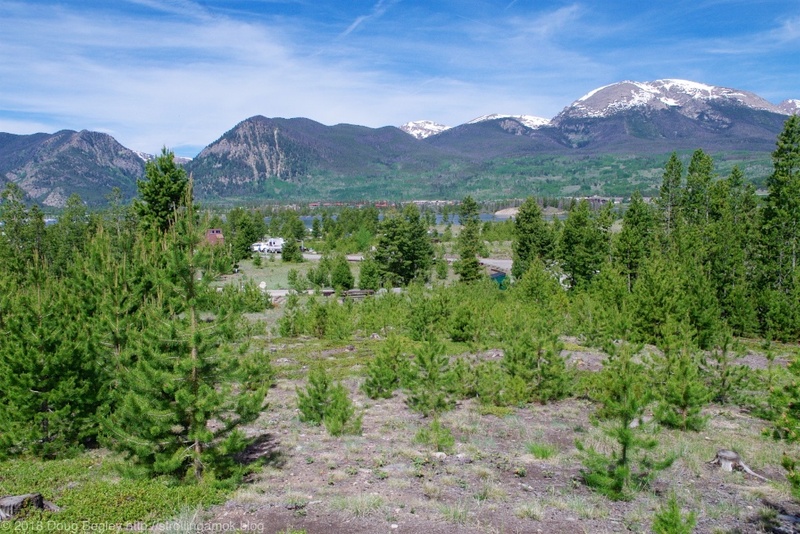 The speed limit of 40 MPH is perfect to be able to take in the expanses of quiet ranchland before it at last twists along valleys lined with rustic cabins as well as a few abandoned log cabin and shed ruins. The road accompanies a fast-moving stream the whole way. Something about these tiny burgs makes me want to shift away from efficiency and schedule towards seeking out a cup of java and a light meal. At last there’s a turn-off for Rock Creek Hills Road, and once its paved entry turns to bumpy dirt, that wanders through forest. Occasional campsites to one side or the other tend to be very large, suitable for gatherings of off-road vehicle devotees. It being a Wednesday, I was surprised that many sites were already occupied. It was no loss for me, since tree cover was too heavy for solar anyway. I finally came to a three-way split in the road, and on a whim chose to branch off left along a more difficult, narrow trail that was wide enough for the Mighty Furd and not a lot else. Actually an OHV trail, it dove down and undulated across a pasture before heading back into more trees. With a scattering of dark clouds overhead, I gave some thought to biting off more than I could chew. The “roads were still fine during a downpour” clearly applied to the initial portions of Rock Creek Road itself, and that’s about it. I stopped to view an MVUM on the old iPad and, yup, I was on an OHV trail. But since I wasn’t scraping paint, knocking back the folding side mirrors or grounding anything out, all was well and I pressed on. 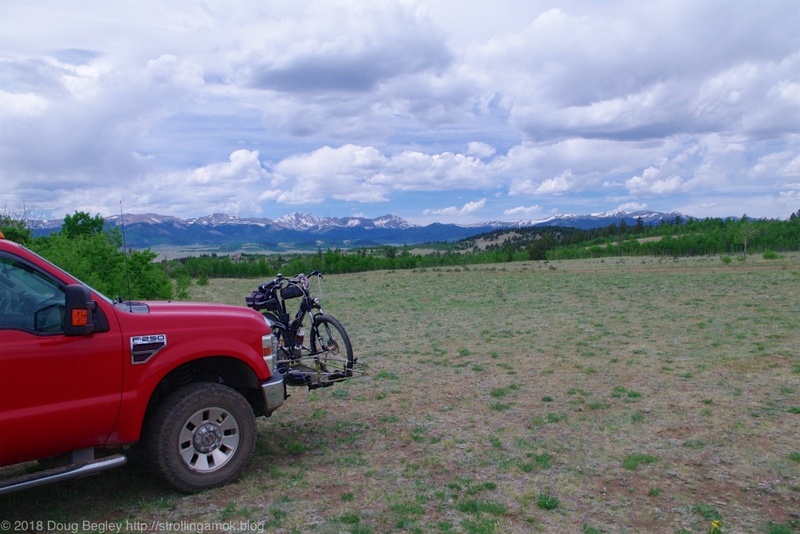 Just before I came to a predicted dead end that petered out overlooking a farm valley, I saw a campsite containing two SUVs and a travel trailer that looked to be about a 22-footer. That was a puzzler! There were only two ways in, both fairly narrow OHV trails that would pose a few problems, so they obviously knew something I didn’t. I backtracked a bit to take a branch heading north, and it was rougher but still fully do-able. That eventually T’d into another main branch approved for street-licensed vehicles only, and I took that toward the valley again. 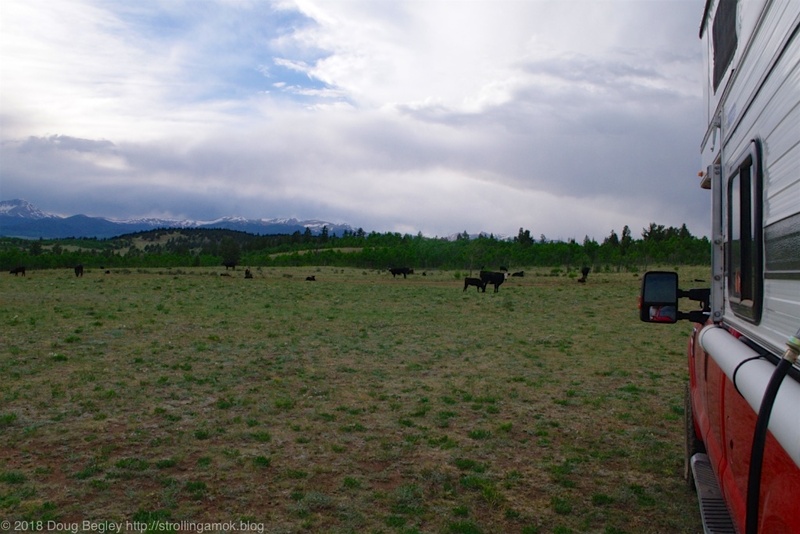 Cattle roamed about the meadows and patches of young trees, and when I hit upon a little-used flat patch of grass with a campfire ring of rocks, I backed in and set up camp. Home at last! 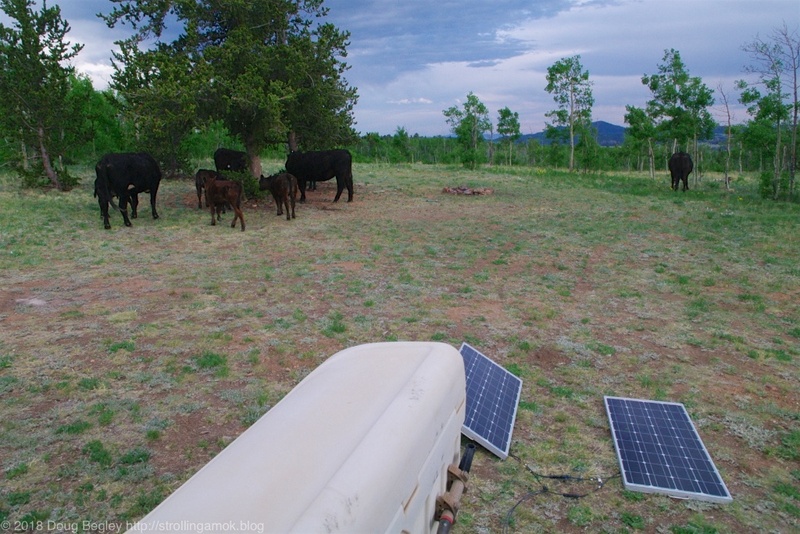 That afternoon was spent catching up on rest and shooing calves away from my solar ground panels. They seem inordinately curious, and can’t seem to help nosing them just enough to knock them down off the stick props I use to keep them angled. At one point I heard one flop to the ground and opened my door to see four large calves gathered ’round to check them out. Naughty calves! At least the lowing is frequent during the day, but absent at night. The only downside is the flies that cattle attract, but I’ll just have to see how that goes. Once my day of departure approaches next week, I’ll need to begin checking weather forecasts to ensure that I don’t try to leave in wet conditions. My tires don’t have a lot of tread left, and they aren’t mud tires anyway. With slopes like this, it doesn’t take much greasy mud to stop the show. Until then, this is just what I was looking for, and we’ll see what transformation the weekend OHVers bring to this specific location, if any. Look, you guys, that panel didn’t fall down by itself. You’re not fooling anybody, you know. I see a noseprint on the glass! This dispersed camping area has a GPS listed as 39.308483, -105.722572, but that leads you to just past the entrance. I recommend having an MVUM in some form if you intend to leave the main road, since a GPS may not show any side-trails. My own campsite that I picked is at 39.339555, -105.743424, and it’s at 9,779′ elevation. It’s good if you need sun exposure, want a distant view of snow-capped peaks, and don’t mind inquisitive moo-cows. I guess they get pretty bored doing little but eating grass all day and, admittedly, the Intrepid is one fascinating rig. And more moo. Watch your step, please. Moo, and poo. A long drive for a closed camp always leaves me in a poor mood. First time for me, so at end of day, it more threw me into a desperate “find a fix” mode. If the only solution wound up to be to backtrack, then I’d be in a bad mood! Keep up the good posts. I enjoy every one! Thanks for the encouragement, Pam. I’ll be sitting on my keister in Illinois soon, so prep yourself for some clinkers! Goddam you’re a good writer, always enjoyable. Thanks for your effort! Hemingway I’m not, but if you enjoy it, that’s plenty good enough for me! Thanks! I am enjoying it, and thanks!